It is worth noting that there must be something special about the Quran that Allah Himself took responsibility to safeguard it. This is the reason why the Quran is still in its original state as it was when first revealed upon the Holy Prophet many centuries ago. It is sad to say that today, the Muslims either keep the Quran in their homes as a symbol of auspiciousness or merely recite it for requital. The irony is that if someone learns the translation and exegesis of the Quran, considers himself a scholar and starts presenting Islam in the light of his superficial knowledge. This is how various sects in Islam emerged, in which the so-called scholars declared fellow Muslims infidels. Such scholars are completely oblivious to the true teachings of the Quran. Their innerself (nafs) is infected with various esoteric ills and their inwards have become lifeless as a result. That’s why, instead of taking guidance from the Quran to correct their inwards and outwards, they waste their energies on criticising others. The Quran only stays to their tongues let alone making any impact to their inwards. They have no idea of the eminence of the Holy Quran and why it was revealed. The Quran guides towards the path of Allah Almighty. It has the depth and vastness of knowledge to provide guidance in resolving issues of every age. The revelation of Quran was completed over a period of 23 years. This is so that people could really digest the message of the Quran. Verses of the Quran were revealed at certain occasions to present solution to particular issues. The Holy Prophet provided explanation to complex issues that made it easy for the Companions to understand the true message of the Quran and gain guidance from it. The Quran has been a source of guidance since the Holy Prophet’s era and will continue to be so for the future generations. Explanation: As the Muslims moved away from the teachings of Islam, they lost their dignity in the world. Today’s Muslims are like a pile of ash without any spark. The only way to truly understand the soul of Islam is to understand the true message of the Quran. Only a perfect spiritual guide can explain the real and hidden meanings of the Quran. Therefore, one first needs to search for a perfect spiritual guide, then spend time in his company to attain purification of the innerself and learn the true meanings of the Quran. Every word, in fact every letter of the Quran contains hidden meanings that we should strive to learn. 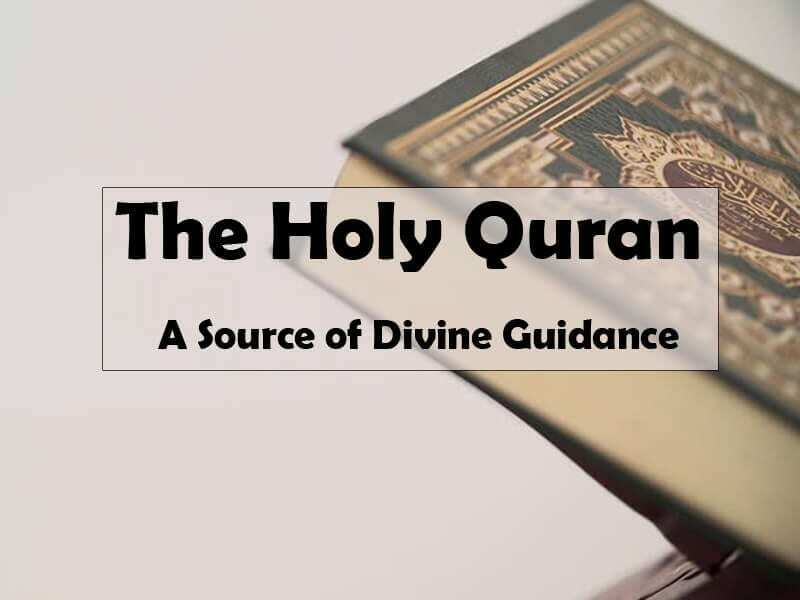 Allah Almighty describes the Quran as light and guidance so that we use that to find the path to Allah and follow that to attain Divine vision and closeness which is the purpose for our creation. The Quran teaches us that in order to attain Divine vision and closeness, we need to follow the teachings of the Holy Prophet. For this, we have the life of the Companions as an example for us to follow. The Companions first attained purification of their innerselves, this allowed them to understand the true message of Islam. The Companions used to sit in the Holy Prophet’s company and listen to his sayings. They used to attend these sessions with utmost attention and respect. A Divine Universal Man is the deputy of the Holy Prophet in his era. We need to follow the Divine Universal Man of our era as the Companions used to follow the Holy Prophet to fulfil the purpose of our lives. The Divine Universal Man needs to be the one who has attained the status of annihilation in Prophet Mohammad and annihilated in Allah and his every action is according to Sunna. Explanation: All of the Companions of the Holy Prophet achieved the highest status as a result of the company of the Holy Prophet. In particular the four most prominent Companions i.e. Abu Bakr Siddiq, Umar ibn Khattab, Ali ibn Abi Talib and Usman ibn Affan. When we look around us, we find a lot of people who appear to be practicing Muslims. They pray five times a day, give zakat, may have performed Hajj and even many of them would know the Quran by heart. But are their innerselves purified and free of inwardly ills – i.e. backbiting, lying etc.? We find many of them who look for others’ weaknesses, they brag over their prayers and worships. Allah says for such people that He has put a veil over their inwards such that they cannot understand the teachings of Islam. It is clear from these verses of the Quran that, people who do not act upon the teachings of the Quran in this world will be raised up blind on the day of Resurrection. We need to ask ourselves how we have spent our lives so far. If we look closely, we will find that in fact we have gone away from the teachings of the Quran and have started living our lives according to our worldly desires. Despite having all the amenities that make our lives comfortable, we still do not find inward peace. That’s because our inwards only find peace in the pleasure and closeness of Allah Almighty. Allah is closer to us than the distance between the membrane and adjoining layers of onion leaves but we do not recognise Him and don’t feel His closeness because of our own ignorance. The purpose of our lives is to gain gnosis of Allah. The fact of the matter is that we can only recognise Allah once our innerselves have been cleansed and purified of all the inner grimes and ills. And that is only possible through company of a perfect spiritual guide. Meaning: Find an ally (spiritual guide) before embarking on a journey (to gain gnosis of Allah). Explanation: A perfect spiritual guide is like a launderer who cleanses his disciples’ inwards through his gaze of all the inwardly grime and ills to enable their souls to gain Divine closeness and presence. Allah draws man’s attention to Himself again and again throughout the Holy Quran. We should strive to learn and understand the true message of the Quran and seek refuge from such prayers and rituals that may make us arrogant instead of being a source of inward peace. Explanation: Put your best efforts into achieving your goals. Never stop, keep challenging yourself on achieving more and more. Once you have achieved your initial goal, set yourself even higher goal and put even more effort in achieving that. There is no point in praying for the sake of praying, strive for the prostration that will change your inward. Our beloved spiritual guide Sultan-ul-Ashiqeen Sultan Mohammed Najib-ur-Rehman is working hard through day and night to spread the correct teachings of the Quran throughout the world. A large number of disciples of Sultan-ul-Ashiqeen who have got their innerselves cleansed are now living their lives according to the teachings of the Quran which is the real success both in this world and hereafter. May Allah grant health and wellbeing to Sultan-ul-Ashiqeen and give us the strength and courage to remain his loyal disciples. This article is written by Nimra Sarwari Qadri and translated by Waheed Hassan.